The "Take It!" came when observing the sun light streaming in through the windows in the front door of my house. As the sun went up in the morning sky - it put a blast of illumination on the front end of the hall and found the lamp that is at the end of the couch getting caught up and presenting a bit of a shadow from the shade. I wondered what I might be able to do with this as the setting had already been used as an eyelusion some time ago. 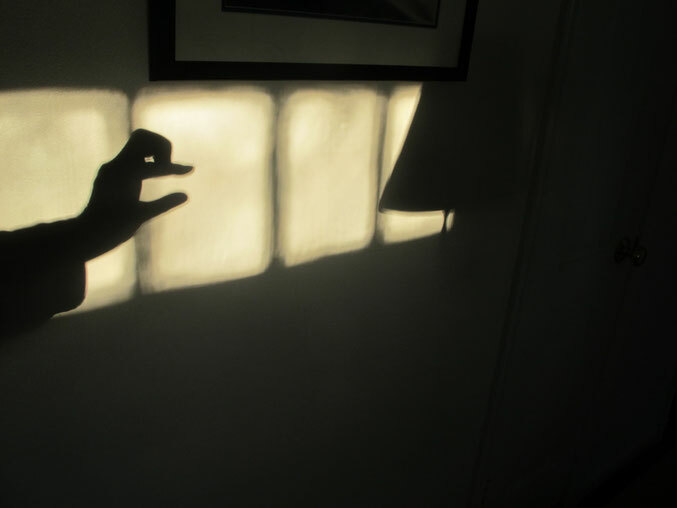 It then hit me to try putting a shadow puppet up - and to my amazement - it worked. By using my left hand to form the goose and my right hand to hold the camera we now have an image that will remain in my mind whenever I look at that wall - lol. The After Take: was ever so much fun. It was amazing to watch the faces of those who had knowledge of this game from childhood mentally go to their youth set of mental images and return to the present. There were a few that had not had the pleasure of this game in their childhood - and wanted to know more about it. The joy of explaining how it works and actually helping them position their fingers to obtain their own animal was priceless. All newcomers were shown the goose and a few were additonally shown the dog. To those who had children - I encouraged them to show them the game for it is lots of fun to play. It is interaction like this that helps one know that there are many joys available in each of our lives - many of which we can create and pass along. Here is hoping, no matter how old you are that you too will turn a goose loose somewhere in your house. The wall upon which you do it - will never be the same. Most out there pic I've seen on this site yet! My alligator can eat your goose.